Well it's my turn to bring this quartet of our projects to a close. Judith set us the challenge of making a project of our choice in the colour palette chosen by Rachel Jackson of cream, latte and bordeaux from the May issue of Craft Stamper. 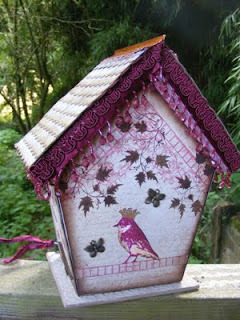 My project is inspired by the lovely little bird house made by Jean Hardy in the April issue of the magazine. 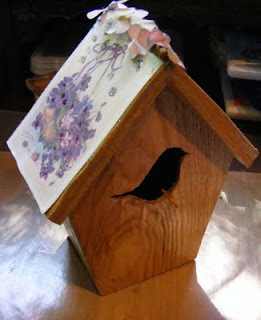 I say inspired because my bird box is not tiny. You may know that my crafty friend Judith has this great idea of Forgotten Friday on her blog, using stamps and goodies that find their way into her craft room but have never been used. I think most of us are guilty of buying more products that we can keep up with. I bought this bird box with the aim of altering it sometime. Now I had been looking at this box as I went in and out of my craft shed and doing nothing with it for far too long, so I decided to go for the Forgotten Friday approach and get on and do something with it. Now as well as my bird box, I decided to use a fab set of stamps from Prima called Green Leaf which were purchased as a result of another article by Rachel Jackson in Craft Stamper which I had shamefully never inked! I also used some papers from a huge 12 x 12 Bella Bella pad from My Mind's Eye that I bought ages ago in Blade Rubber that had incredibly never been touched - except to stroke! I used the corners of the pattern on the paper to make the eaves of the house. I then overstamped with the Notary stamp from Prima in Hazlenut Adirondack ink. I added my favourite maple leaf stamp from Lavinia stamped in Expresso Adirondack and and the door from Crafty Individuals stamped in Plum Archival ink. 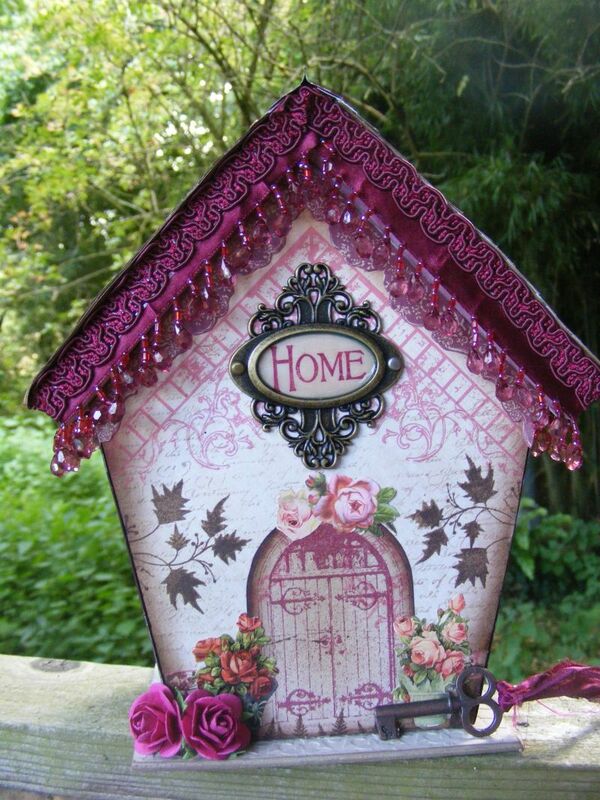 The word "home" is from the new Chocolate Baroque Home Sweet Home set, mounted into a Tim Holtz ornate frame and covered with glossy accents. I decorated the eaves with some beaded trim and braid and added paper scrap roses, paper roses and the little key with some sari ribbon to the front of the box, as you know I don't really do minimalist! The sides of the box got similar treatment with butterflies from the Prima Green Leaf set added and some sweet little laser cut birds and a little stamped grass. 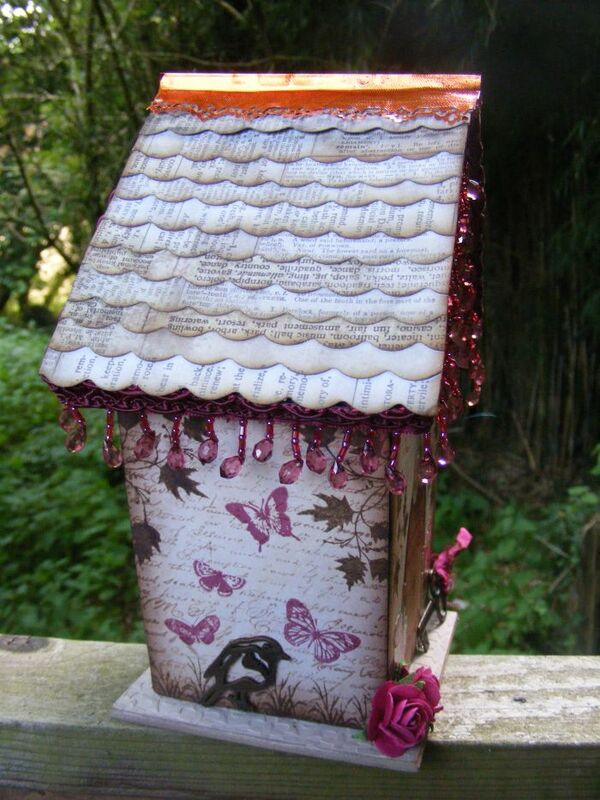 These side views also show the roof which was made of punched strips cut using an X cut punch from a newsprint Tim Holtz paper from the Lost and Found collection, edged with Frayed Burlap Distress Ink. I made the ridge of the roof from thin copper coloured metal which I cut with a lacy edge Fiskars punch. I mounted the box onto a base made from chipboard which I covered in moulding paste through a decorative screen and then painted in crean and inked with more Hazlenut dye ink to highlight the pattern. The back view shows the little bird stamp from the Green Leaf set stamped and coloured with pencils, his crown has been embossed in gold and a couple of brass butterfly charms have been added. Originally the bird was going to be on the front of the house, but in the end I decided I liked it's domestic look, so added the birds to the sides and back panels instead. I did rather stretch the colour palette as I found myself adding more pink and dark brown. Hopefully I haven't strayed too far from the original inspiration! So thanks to Judith for choosing this project, although I have to confess I found it hard to settle on an idea to work on as the field was wide open. Unusually for me this project wasn't planned. I had to work it out as I went along, but I am pleased how it came together in the end and thoroughly enjoyed working in a more organic way! Thanks of course too, to Rachel Jackson for her inspiring colours and to Jean Hardy for her tiny bird box which inspired me to create a larger one. Thanks for popping in to see our different projects - we always appreciate your comments. Elaine, your bird box is gorgeous. You know my love of birds, and this is fulfilling it big time! 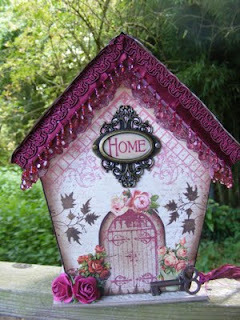 The house is so sweet, with all of the details, which is yor style to a 'T'. I like the metallic touches here and there, and the leaves, butterflies and birds are just lovely. The colour scheme is fabulous. This is a great finish to this month's projects, they have been so varied, it's been a delight to look at everyone else's. 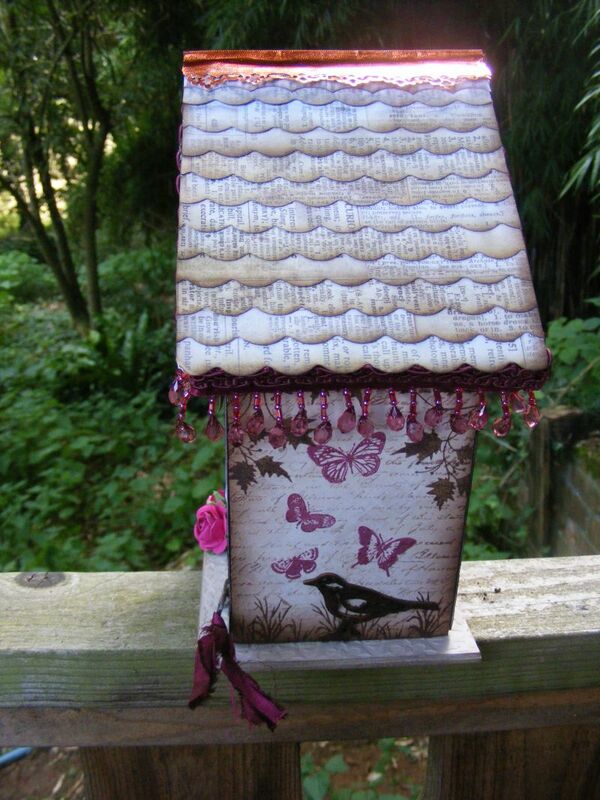 What a very pretty bird house. These colours seem a bit unusual for you but the style is very much yours. Nice to hear that you have managed to use some negelected stash. I am guilty of neglect too. The maple leaf on the other hand....I believe you regularly wear that stamp out!You have also made use of a really wide range of materials but they go together so well. Lovely work. What a very varied collection we have come up with this month! Wow this is brilliant and well done for the 'Forgotten Friday' approach - using some of the things you bought and hadn't used. We all do it - wonder why?? 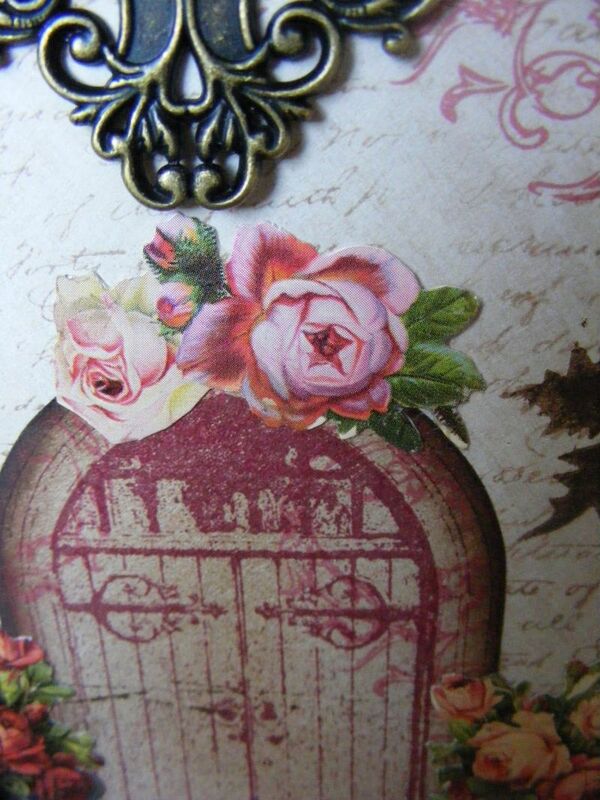 This is a lovely adornment for your craft shed - beautiful. Oh Wow Elaine! This is beautiful and what a lot of attention you have paid to the tiny details. I love the overlapping punched papers on the roof and the other papers are so pretty. Lots of beautiful elements all pulled together perfectly. I love the colours too and it's a stunning finale to our projects this month. WOW, what a beautiful bird box. The colours used are gorgeous, and the embelishments so right. I'm glad you were also inspired by Forgotten Friday, how sinful we all are buying these lovely goodies and not using them.